Now here is a book you don't come across everyday. This is a story that has all the elements of a perfect story and Murakami executes those elements well, balancing them all in a way that I can't recall experiencing before. Those four elements are (in my opinion, for me as a reader looking for a good book to enjoy) characters, story/plot, emotional value and prose. Let's start with the characters, since the three other elements pretty much evolve from there in this book, I think.There are five characters central to the story. Each is unique and well-developed and while those are just two general words to describe the characters, those are the only two words that I love to be able to apply to a whole cast of characters. The characters were believable. Leading straight into the emotional value of the piece, I actually felt hollow and sad when a character died and I felt proud and happy when a character realized how they were changing for the better (trying to avoid spoilers here, my apologies for the generalities). 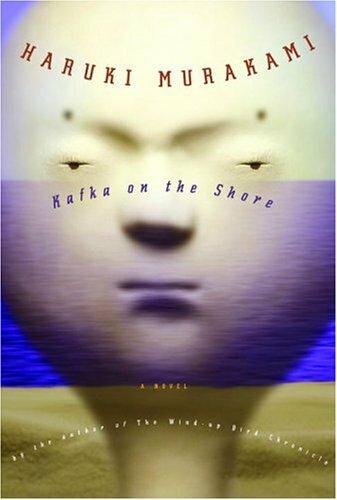 Kafka on the Shore contains several riddles, but there aren't any solutions provided. Instead, several of these riddles combine, and through their interaction the possibility of a solution takes shape. And the form this solution takes will be different for each reader. To put it another way, the riddles function as part of the solution. It's hard to explain, but that's the kind of novel I set out to write. That definitely comes across in this book. Obviously, I've only read it once but I feel like I've just scrapped the surface of what this book has opened up to me (does that make sense?) and I look forward to rereading it and gaining even more out of the experience. You're afraid of imagination. And even more afraid of dreams. Afraid of the responsibility that begins in dreams. But you have to sleep, an dreams are a part of sleep. When you're awake you can suppress imagination. But you can't suppress dreams. The prose is what blends all these elements together. Murakami's style is flowing and engaging, never dull. The contrast between the first person POV of a 15 year old boy and the third person POV from Nakata and Hoshino works very well in telling the story and allows for the prose to be changed up. Ugh, I'm having a terrible time trying to get across how/why I loved this story so much. It's beautifully crafted, the characters are stirring and believable, the prose is vivid and delicate and the story is dynamic and thoughtful and different and even if you don't have all the answers you thought you would like to have when you were reading the book, that's okay. The story can be gruesome and strange and twisted but it all fits and seems so natural. I love the role that the library, books, music and nature play. I felt like this story was written for me. I am sure I will reread this one many times in the future. As I sit there under the shining night sky, again a violent fear takes hold of me. My heart's pounding a mile a minute, and I can barely breathe. All these millions of stars looking down on me, and I've never given them more than passing thought before. Not just stars - how many other things haven't I noticed in the world, things I know nothing about? I suddenly feel helpless, completely powerless. And I know I'll never outrun that awful feeling. EDIT: Extra stuff I forgot to say when I wrote this post: Hoshino is my favourite character. The violent bits freaked me out but that was great, they did what they should have done. The description of the novel talks about a murder where the perpetrator and victim are pretty much unknown and I thought 'What the heck, how does that work?' but when you read the book it makes perfect sense and is fantastically executed.